I loved Lost Voices so much! I'm really looking forward to reading the sequel. After parting ways with her troubled mermaid tribe, Luce just wants to live peacefully on her own. But her tranquility doesn’t last long: she receives news that the tribe is on the verge of collapse and desperately needs her leadership. Anais, the tribe’s cruel queen, wants Luce dead. Dorian, the boy Luce broke mermaid law to save, is determined to make her pay for her part in the murder of his family. And while the mermaids cling to the idea that humans never suspect their existence, there are suddenly ominous signs to the contrary. But when Luce and Dorian meet, they start to wonder if love can overpower the hatred they know they should feel for each other. Luce’s new friendship with an ancient renegade mermaid gives her hope that her kind might someday change its murderous ways. But how can Luce fulfill her rightful role as queen of the mermaids without sacrificing her forbidden romance with Dorian? Full of miraculous reunions and heart-pounding rescues, this haunting second installment in the Lost Voices trilogy finds Luce eager to attempt reconciliation with humans—as long as war doesn’t break out first. Oh! This is one of the next books on my reading list. 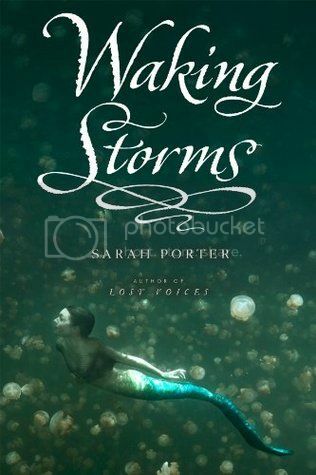 I also enjoyed Lost Voices and cannot wait to see what happens in Waking Storms. I hear it's even darker... We shall see!! Great pick! Thanks! I'm on a bit of mermaid kick lately. Can't wait for this one! Awesome pick that I am going to have to check out! As soon as I put down Lost Voices, I hoped there'd be a sequel. Bummer! I swooned for the first one.